A concussion is a traumatic brain injury caused by an impact to the head or body. Every concussion is different, and can present with different symptoms. Although the symptom severity varies from injury to injury, there is no such thing as a minor brain injury. Injuries, including concussions, are an unfortunate reality of playing sports. The risk of concussion is greater in youth sports, as children’s brains are more susceptible to injury than adults’. As an elite youth sports program, North Park Hockey is committed to reducing this risk as much as possible through a comprehensive concussion policy including education, prevention, and injury response. The goal of this policy is to minimize the risk of these potentially career-ending injuries, ensuring that our athletes can develop into the best hockey players possible. Below is our comprehensive concussion policy. For more information on concussion signs, symptoms, and treatment, please visit the CDC Heads Up Concussion Page. Any questions about the policy may be directed to the league Concussion Coordinator: Gary Simpson. Education is the foundation for effective concussion management. Many stakeholders must play a role in preventing and properly managing concussions, and it is important that everyone knows the role they need to play to keep everyone safe. 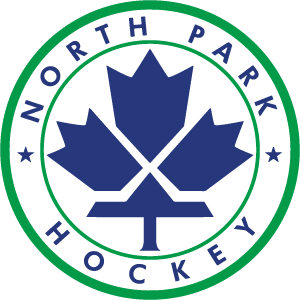 North Park Hockey requires education for all athletes, coaches, and volunteers. Mites –No formal education required. We recommend parents and coaches model appropriate attitudes towards concussions by openly discussing concussions with athletes and refraining from dismissive responses to suspected concussions in others. Squirts: Required annually to complete the Brain 101 online concussion training for athletes together with their parent or guardian. Be sure to bring a note signed by your parent or guardian confirming that you completed the course, or you will not be allowed on the ice. An email from the athlete’s parent or guardian confirming completion sent to the league Concussion Coordinator is also acceptable. concussion training for parents from the CDC. We also recommend that all parents review the educational materials on this site. Often, the symptoms of a concussion are delayed, and injuries on the ice only begin to present hours after the activity is over, while the athlete is at home. Parents can play a huge role in concussion recovery by being aware of the signs and symptoms of concussion. You know your children best, and if something seems wrong, it probably is. To ensure that concussions are properly managed, there are three important roles to be filled. It is important to understand the roll you play, as well as how your job fits within the larger plan. The League Concussion Coordinator serves as the point person for all concussion education and clearance records for the league. Who is it? North Park Hockey Board member; currently Gary Simpson. Ensuring all athletes have completed a baseline King-Devick test, consistent with test maker guidelines. Maintaining record of written clearance to begin return to play protocols from physicians for athletes diagnosed with a concussion. Concussion spotters watch over practices and games and initiate concussion evaluations. At least one should be present at each game and practice. Spotters must receive training on administering the King-Devick test. Ensuring that the appropriate concussion letter is sent home with any athlete evaluated for concussion, along with a follow up email requesting receipt confirmation. Obtaining physician clearance from the athlete and providing to the Concussion Coordinator. Overseeing graduated return to play. Continuing to play after suffering a concussion can have severe consequences. At best, it can extend recovery time. At worst, failing to remove an athlete puts them at increased risk for suffering another concussion by lowering the threshold of injury. In rare cases, a second injury can cause catastrophic brain swelling, termed second impact syndrome. All team activities are supervised by a Concussion Spotter. If an athlete exhibits concussion signs, or if the athlete or a teammate reports concussion symptoms, the player is removed from the activity for a concussion assessment. The Concussion Spotter performs the evaluation using the King-Devick test. If the test is positive, the athlete is removed from play. If the test is negative or inconclusive, coaches or volunteer spotters may use discretion to either keep the athlete out of play (if a concussion is still suspected), or return the athlete to play. Remember: When in doubt, sit them out.